During our initial consultation, our goal is to get to know you, your likes and dislikes, and to capture your vision of your picture perfect yard. 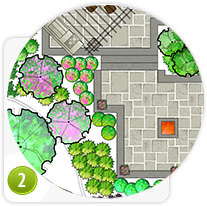 Together, we will do a walkthrough of your property and discuss your ideas for what you would like to see in your yard. We will also add our ideas and visions that could be included in your design. To assist you in your decision making and planning, we have a digital portfolio of previous jobs for you to browse and retrieve ideas. At this time, we will develop a project budget that meets your expectations. By developing a budget at this early stage, we ensure that the design and project will be completed successfully. After our initial meeting, we will prepare a detailed full colour landscape design which captures your ideas and visions. We want to ensure that the design incorporates your vision as well as appearance, functionality and flow. There is a fee for your design. This fee is determined by the complexity of both the site and the design. Peaks and Valleys Landscaping, we take pride in working on one job from start to finish, so you won’t be left with an incomplete job for any period of time. We do our best to keep our jobs on schedule as long as our Calgary weather cooperates. The schedule agreed upon, allows for your convenience and gives you the opportunity to be included in the process and to see your vision realised. We strive to move the project along as quickly as possible once we begin. At last, we are ready to begin transforming your vision into reality. 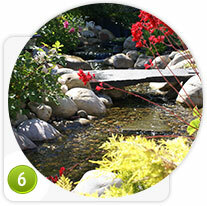 Peaks and Valleys promises to complete your yard one aspect at a time. From the tree planting, to irrigation, plants, mulch and grass, we complete each process in an orderly and timely fashion. We follow the design one step at a time and consult the client every step of the way. We understand that this is your home and we do our best to maintain professionalism. We ensure that after each work day, the site is clean and organized. Your yard is complete and it is time for you to enjoy! 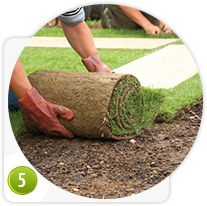 Once complete, we will walk through your entire yard, going over each and every aspect to ensure your satisfaction. 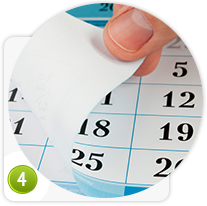 There will be no surprises, as we like to keep our clients informed throughout the entire process. This is a time for you to relax, reflect and enjoy your new garden paradise!